We’d love your help. Let us know what’s wrong with this preview of The Boy Who Grew a Forest by Sophia Gholz. To ask other readers questions about The Boy Who Grew a Forest, please sign up. I often read books with my daughter that introduce me to people in history that I have never come across in my adult life. This book is about a young boy, Jadav Payeng, that lives on a small island in northern India. As a young boy, he sees how the monsoon season affects his home. He finds snakes that are left stranded on sand bars and so decides to plant some trees. He plants bamboo saplings. That's just the beginning. As Jadav grows up, he continues to harvest the forest. What develops is a lush I often read books with my daughter that introduce me to people in history that I have never come across in my adult life. He plants bamboo saplings. That's just the beginning. As Jadav grows up, he continues to harvest the forest. What develops is a lush 1,300 acre utopia for animals. Jadav protects the area also from poachers and others infringing on the land. This hidden treasure wasn't discovered until a group of scientists were tracking a herd of elephants and came across it. Audience: Ages 6-9 years old. A. 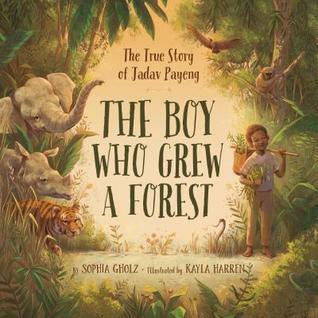 The Boy Who Grew a Forest is a partial biography of a young boy named Jadav Payeng. This book details the time in Jadav's life when he fought against deforestation in India. After he saw the result of deforestation and erosion around his home, he began planting trees in hopes to stop the problem. Years later, the trees he planted grew to be a forest. This book does not detail Jadav's whole life, but it details a very significant time in his life. B. This book is an authentic biography as the events in this story are based on a true story. There are a few details that are not completely accurate, such as that Jadav was 16 when he began planting trees but in the book he appears as a much younger child. However, the overall events and story line occurred and are accurately told throughout the story. An inspirational story for children and grandchildren of acting locally and having a global impact. Sophia's lilting tone of telling Jadav's story, grows a forest before your eyes. With delicious and rich illustrations, we learn about a young man's vision, determination and humble heroics -- and straightforward lessons about the importance of nature in improving peoples lives. The end notes add perspective and activities for all. A must for your children's library! The story of a little change-maker, this book is about a boy who turns compassion into action. One seed, one plant, one tree at a time, he grows a forest. And makes his home, a river island in northern India, a greener home for many species. Written in simple lyrical language, the words flow beautifully to tie in with the lush artwork in earthy tones. The back matter offers readers a way to take action, beyond leaving them touched and inspired - a perfect finish to a children's book! A must read book for every child...and parent and teacher! This is the story of one boy's desire to help the animals and bring life back to the land. Lyrical text pairs perfectly with glowing illustrations - kids will feel as if they are right there with Jadav Payeng and will be cheering for his success! Thoughtful back matter and a plant-a-seed activity allow for further engagement. This is a thoroughly brilliant picture book about an unsung hero that won my heart! Sophia Ghotz’s telling of Javad Payeng story is absolutely beautiful. Her use of soft yet powerful language takes the reader on Javad’s journey while he planted, tended to, and protected a forest. Javad’s quote, “Only by growing plants, the earth will survive” is such an important lesson for young readers. Ghotz’s also offers instruction on how to nurture your own seedlings for a hands-on activity, perfect for Earth Day. This gorgeous book belongs in every classroom and library! When young Jadav Payeng saw that floods were eroding the land and endangering animals and humans, he wanted to make a difference. Village elders gave him 20 bamboo saplings, and with those saplings, he began growing his forest. His passion for caring for all life grew as his forest grew. Such an inspiring story for kids--one person can make a difference! When so much of the news about our environment is overwhelmingly negative, it is refreshing and important to read a biography about a person who has made a positive impact on his local environment. When Jadev was a boy he noticed what happened when the trees were destroyed by flood. He shared his concern with village elders who gave him bamboo to plant. The book illustrates the value of hard work and ingenuity and the relationships between plants and animals. Based on the true story, The Boy Who Grew a Forest takes you on a journey to India. It is a touching story about compassion and love for nature. This picture book introduces a young reader to animals and plants in a poetic way. You witness the growth of a child and a growth of a forest together- a beautiful metaphor for the cycle of life. The plant-growing instructions at the end add a lovely interactive component that kids would surely enjoy! This inspiring true story about a boy who yearned to make a difference in the world should find a home on every bookshelf. Eloquently written and beautifully illustrated, this touching story reinforces that small actions are never small, but instead can serve as the foundation for something much bigger. We are limited only by what we can envision. Thanks to Jadev "Molai" Payeng's vision, a home now exists for countless plants and animals in a most unexpected place. The Boy Who Grew a Forest is the true and inspirational story of Jadav Payeng. Distressesed by the effects of deforestation and erosion to his island home in India, Jadav made it his lifelong mission to plant a forest! Lyrically written, with artwork which beautifully complements the text, this biography is a must read for all. As a college student, I had a bumper sticker that said: Have you hugged a tree today? So, naturally I love this book! What a beautiful, inspiring story of love and dedication. It truly only takes one person to care and make a huge difference. Taking care of our earth is the noblest thing we can do. This is a wonderful addition to meaningful picture books! From the lush cover to the lyrical words inside, this is a delightful representation of Jadav Payeng’s life’s work. This story will help children examine the environment, and how changes and choices make a difference. What a wonderful story of the impact of one person! It ends with a call to action sure to inspire children to do more for their world. This is a stunning new picture book! It is the true story of a young boy who has a passion to improve his community and world. The illustrations are tremendous and realistic and add so much to the story line. There are several nonfiction connections and activities a young reader can enjoy at the end of the book. Let this story inspire you to improve your community and the world! 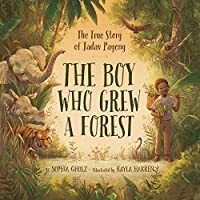 I loved this true and inspirational story of Jadav Peyeng, a boy in India who responds to wildlife dying on his island by planting trees. As the trees grow, the animals come back, surely a message for our times. Hopefully this book will inspire children around the world, and their adults, to care for the planet. A stunning book. This beautifully written story details the life of Jadav Payeng, an inspirational environmentalist who amazingly grew a forest starting with just 20 seedlings. The illustrations are gorgeous. But above all, the message is what lingers after every read; that anyone, with enough determination, can make a valuable and lasting difference to our planet and it's people. This is such an amazing book! It touches on dreams, determination, conservation, passion, and shows that even young people can change the world. 5 stars for The Boy Who Grew a Forest! Sophia Gholz is a children’s book author, tree-hugger, music lover, magic seeker, and avid reader. As a kid, Sophia spent most of her time riding horses, causing mischief with her brothers, or exploring the globe with her parents. The latter often included tents and forests, while accompanying her father on various scientific adventures. Sophia grew up in Florida, went to art school in California, Sophia Gholz is a children’s book author, tree-hugger, music lover, magic seeker, and avid reader. As a kid, Sophia spent most of her time riding horses, causing mischief with her brothers, or exploring the globe with her parents. The latter often included tents and forests, while accompanying her father on various scientific adventures. Sophia grew up in Florida, went to art school in California, and met her husband in Manhattan. She now enjoys life by the beach with her family.